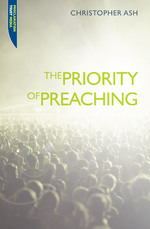 Christian Focus Publications kindly sent me a copy The Priority of Preaching by Christopher Ash for review, and I’m very glad they did! There are plenty of books about preaching, and I’ve read a fair few. Most of them I have appreciated and found helpful. It is no different with this little book. It is a little book but its content is weightier, more profound and much more important than its size would suggest. Furthermore there are a few features that make this book interesting and impressive. One of the first things I noticed about this book was not it’s content but the way it was written. Christopher Ash writes well. Something I have noticed, but only really recently thought about is just how well Anglicans write, I mean that to be taken as commendation not as an expression of surprise! Think Stott, Packer and to them I would now add Ash. His writing is erudite, one feels one is learning something, indeed much, in the reading of this book (as should be the case). The author’s knowledge not only of his subject, but of culture, history and literature is obviously extensive, though at no time does he come across as pompous in the presentation of this knowledge. He quotes frequently from a wide range of authors, not just spiritual greats, but ‘secular’ authors too. All this makes the book a joy to read. A second feature that makes this book stand out from the crowd is that the author bases each of the chapters upon a section of Deuteronomy. This has two important benefits. Firstly the book puts into practice what it preaches, though obviously not a sermon, it was based on sermons, and being rooted in the Word, it is a kind of literary test-case of the thesis of the book itself. Secondly, and obviously, it means that much, if not all of what the author says is firmly rooted in the authority of Scripture itself, this again harmonizes well with the theme of the first chapter, the author is not so much writing his own message but God’s. Not many books about preaching expound Scripture throughout in a systematic way, this one does, and it is all the more persuasive for it. All through the book Ash, communicates to the reader his belief in, and enthusiasm for, what he is writing, and he does so convincingly because he bases what he is writing on Scripture. I highly recommend this book for all ministers of God’s Word, but would also happily commend it to anyone who sits under preaching. In a day when the Church is so sadly given to drama, and endurance singing sessions, ‘talks’ and any number of other activities (anything other than preaching), this book is a breath of fresh air. I look forward to reading the rest of the series as it is issued.